Many of the locals, including the owner, treat women with absolute disrespect, whether visiting the pub or simply walking past. Lager louts shout abuse and sexual comments at everybody walking past. And as I have recently moved close to this pub, I have witnessed this happening to many others at all times during the day and night. Even while ordering food or drinks at the bar, locals are freely able to make upsetting comments across the bar in front of others with no foundation to their comments. Now many residents cross a dangerous road before the lights, just to avoid the harassment. I do not assume the owner will make any changes as he is often seen among the locals laughing and allowing the incidents to continue. I just wish to inform others before you're disappointed. This pub is purely for the local lager louts and any other locals are not welcome. 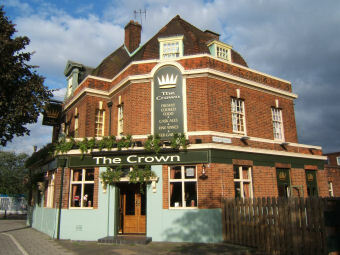 The Crown is on a main road heading out of Richmond. I paid it a visit as I was passing. But this is a fairly basic boozer that dispensed 2 ales - Fullers London Pride & Youngs Bitter. There seemed to be a focus on sports on the TV and it was gearing up to the afternoon's 2 live football matches. Shocked that this dive actually gets 6.2 out of 10, I expect the landlord's had a bit of a whip round and enlisted all the locals. And this really is a locals place- red-faced old men shouting across the room to each other in some unintelligible dialect, and unfortunately even out in the beer garden you're not immune... some mad woman came out, babbled something that was impossible to understand and then promptly departed. It's also directly over a major flight path. The barmaid was quick and efficient, which is about all I can say in defence of this place. This is a great pub. Everyone is really friendly and the food is excellent. In addition it has a very nice outdoor area and the best news is it is planning to put a large plasma screen outside for the world cup. Great news for smokers who enjoy football and have a problem dealing with the stress of England games without a fag or have to go out and miss the key goal!!! Really recommend it. A change of management has brought about an increase in trade and more of a "feel good" factor which this pub has sadly lacked in the past. It's still basically the same pub as before, but it's amazing what can happen if you get a couple in who are prepared to make a bit of an effort. This is a difficult area for a pub, it's slightly out of Richmond Town Centre so it's not on the circuit, but it's in an area where there's a mixture of offices and residential flats / houses. Had a good pint of Wadworths 6X last Thursday.